As well as enabling you to copy music, messages and more from your Android device to your computer, Droid Transfer also provides the ability to manage all files on the device. 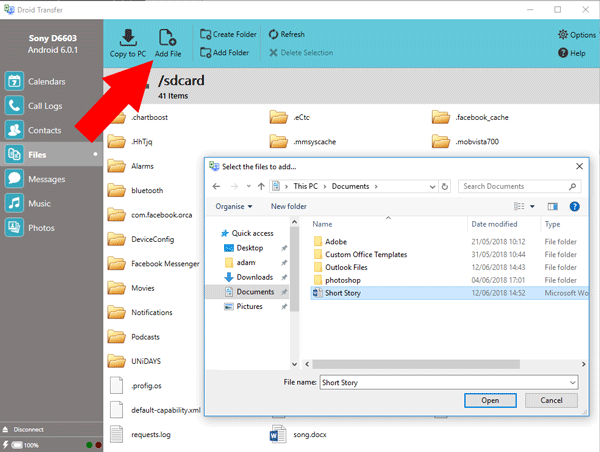 In this way, you can browse, copy, move and delete files and folders from your Android device, and add files from your computer to the device. You can transfer files between PC and Android using Wifi or USB cable. Visit our TouchCopy page if you need to share and manage files on iPhone instead. Open the "Files" tab from the feature list. Choose a location in the directory (e.g. 'sdcard'). Select the file you would like to add from your computer, and click "Open"! Backing up your Android files to your computer is easy. Simply select files and/or folders from the directory in the "Files" tab, and click "Copy to PC". Choose a save location on the computer, and confirm the save! Droid Transfer also allows you to add folders/files from your computer to your Android device. To do this, select a location in the Android directory in Droid Transfer, then click "Add File". Choose the file that you would like to copy to your Android device, and confirm the copy! In addition to sharing files between PC and Android, Droid Transfer also allows you to manage and delete files on your Android device. Please be advised that some Android system folders do not allow any editing. Navigate through the directory by double-clicking folders to view their contents.